Don’t you just want to reach out and grab one of those cookies up there? I really wish you could because they are freaking fantabulous. Chocolaty, but not overly sweet, with a nice hit of spicy heat. In a moment of either sheer genius or outright madness, I dug into the spice cabinet and pulled out a secret weapon to really turn up the heat because I’m a sweet/spicy freak. How else would you explain that I used a Chili Spice Rub in cookie dough? I looked at the ingredients listed on the spice rub before committing to this madness. Chili pepper and other spices, pure ground coffee, brown sugar, and salt. No red flags there. In fact, all of those ingredients can enhance the flavor of chocolate. And then, because I wanted to “feel the burn”, and because I had a good amount of chipotle cinnamon sugar left over, I started giving the dough balls a second roll in the spiced sugar. Both of these choices resulted in a cookie that satisfied my sweet tooth and gave off just enough warmth to make my mouth tingle with happiness. Enjoy these with a cold glass of milk for a grown up version of an afternoon snack. BAH Note: I added a super special ingredient to Martha’s recipe – Fire & Flavor Coffee Chili Spice Rub. I also gave the cookies a double roll in the chipotle cinnamon sugar for a little extra spice. But that, along with adding chipolte powder to the cinnamon sugar is 100% optional. Optional, but highly recommended by a sweet/spicy freak like me. I was concerned that the center of the cookies still looked a bit moist when I pulled them out of the oven after 10 minutes. But they set up beautifully and were not at all undercooked. Place racks in upper and lower third of the oven and heat to 400 degrees. In a small bowl, combine 1/4 cup sugar, cinnamon, and chipotle powder (if using) and set aside. Line two sheet pans with parchment. Sift together the flour, cocoa powder, cream of tartar, baking soda, coffee chili rub (if using), and salt. In the work bowl of a stand mixer fitted with the paddle attachment, cream together the butter and 1 1/2 cups of sugar for about 2 minutes on medium speed or until light and fluffy. Scrape down the sides of the bowl, add the eggs one at a time and beat until incorporated after each addition. Turn the mixer down to low, slowly add in the flour mixture, and mix until combined. The dough will be moist. Using a small ice cream scoop or a spoon, form balls of dough (approximately 1 tablespoon per ball). Roll the dough balls in the chipotle cinnamon sugar to lightly cover and then reroll them in your hands to push the spice mixture into the dough. Roll them a second time in the chipotle cinnamon sugar and gently shake to remove any excess. Place six dough balls on each pan, leaving about three inches between each ball of dough. Bake for approximately 10 minutes, rotating the pans after 5 minutes, until the cookies are just set in the center and begin to crack. Cool the cookies on the pan for 5 minutes and then transfer to a rack to cool completely. My little minxes would devour that whole plate! Kitch, I devoured that whole plate. This is definitely a recipe you could get the minxes involved with…their little hands are perfect for rolling balls of dough in sugar. The closest I’ve ever been to chocolate with spice are those little chocolate crabs you sent me. I know that was Old Bay and not chili but I’m interested in your experiment here. Boo, the Old Bay chocolate crabs are something that you probably either love or hate. 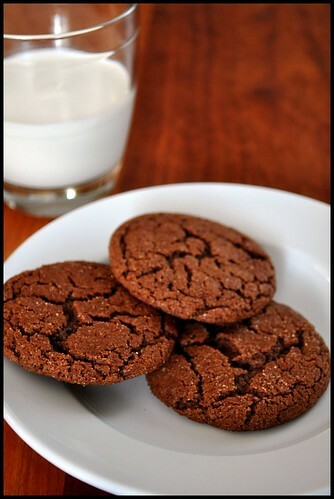 These cookies have more of a gray area since you can control the amount of spice used. The thing is to taste the sugar/spice as you mix it…start with a little spice and stop when it’s where you like it. And like I said, the chipotle powder and chili rub are 100% optional. That picture looks beautiful!!! And what a crazy but good sounding cookie! Thanks Elizabeth. They taste even better than they look in that picture. I honestly can’t think of a better combo than sweet and spicy. It’s more than just a taste…it’s an experience, as absurdly profound as it sounds. These look incredible. Ali, that’s a wonderful description because it absolutely is more than a taste. Hope to maybe see these pop up over at 3 Baking Sheets soon. GET TH”EE TO A GLASS OF MILK! Emily, a glass of cold milk is this cookie’s best friend. Ingrid, these are my new favorite cookies. Hope you will give them a try and let me know how you like them.